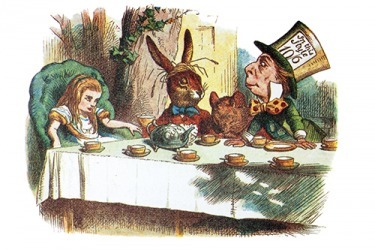 The Mad Hatter often spoke in riddles in the story "Alice in Wonderland". The definition of a riddle is a problem that is difficult to solve or that has no clear answer. An example of a riddle is an unexplained situation. An example of a riddle is the question: "What is the shortest sentence in English." The answer is "I am." "riddle." YourDictionary, n.d. Web. 15 April 2019. <https://www.yourdictionary.com/Riddle>. a coarse sieve for grading gravel, separating chaff from grain, etc. To pierce with numerous holes; perforate: riddle a target with bullets. To put (gravel, for example) through a coarse sieve. Middle English ridelen to sift from riddil sieve from Old English hriddel ; see krei- in Indo-European roots. A question or statement requiring thought to answer or understand; a conundrum. One that is perplexing; an enigma. To propound or solve riddles. Middle English redels from Old English rǣdels ; see ar- in Indo-European roots. A verbal puzzle, mystery, or other problem of an intellectual nature. "Here's a riddle: It's black, and white, and red all over. What is it?" To speak ambiguously or enigmatically. Riddle me this, meaning Answer the following question. Middle English redel, redels, from Old English rÇ£dels, rÇ£delse (“counsel", "opinion", "imagination", "riddle"), from Proto-Germanic *rÄ“dislijÄ… (“counsel, conjecture"). Akin to Old Saxon rÄdisli (Dutch raadsel), Old High German rÄdisle (German RÃ¤tsel (“riddle")), Old English rÇ£dan (“to read, advise, interpret"). A sieve with coarse meshes, usually of wire, for separating coarser materials from finer, as chaff from grain, cinders from ashes, or gravel from sand. A board with a row of pins, set zigzag, between which wire is drawn to straighten it. The shots from his gun began to riddle the target. To fill or spread throughout; to pervade. Your argument is riddled with errors. You have to riddle the gravel before you lay it on the road. From Middle English riddil, ridelle (“sieve") from Old English hriddel (“sieve"), alteration of earlier hridder, hrÄ«der from Proto-Germanic *hridÄ… (“sieve"), from Proto-Germanic *hrid- (“to shake"), from Proto-Indo-European *krey-. Akin to German Reiter (“sieve"), Old Norse hreinn (“pure, clean"), Old High German hreini (“pure, clean"), Gothic ðŒ·ð‚ðŒ°ðŒ¹ðŒ½ðƒ (hrains, “clean, pure"). More at rinse. Riddle, Life of Benjamin F.
Fred couldn't resist a mystery and here was a riddle on-site. The upper end contains a perforated riddle plate which is placed directly over the riffle box, and under certain circumstances mercury may be placed behind the riffles. At the same time he admits, firstly, that to mark the barrier between unconscious and conscious is difficult; secondly, that it is impossible to trace the first beginning of consciousness in the lower animals; and, thirdly, that " however certain we are of the fact of this natural evolution of consciousness, we are, unfortunately, not yet in a position to enter more deeply into the question " (Riddle of the Universe, 191). 8 sqq., and Samson's riddle, Judg.